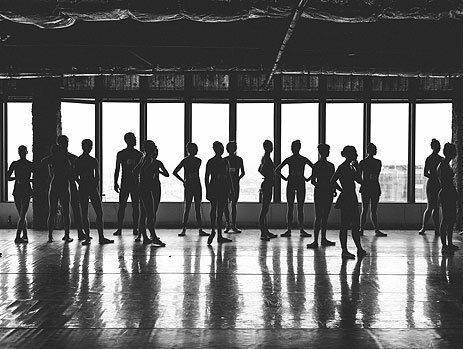 On a recent Sunday afternoon, I made my way to the 32nd floor of the Bloc, the new downtown studio space for American Contemporary Ballet. The massive building (formerly Macy’s Plaza) is under renovation, but no one was paying attention to the exposed ductwork or even the 360-degree views. This was audition day, and dozens of dancers with numbers pinned to their leotards were nervously stretching and waiting for the tryouts to begin. Many of them were professionals, currently with other companies but hoping to be offered a position with ACB. Artistic director Lincoln Jones and associate director Theresa Farrell had invited me for an exclusive peek into the audition process. The dancers would progress (or not) from barre work to center floor combinations to the interview stage. As Jones led the group through multiple exercises, he and Farrell scrutinized the dancers’ feet, leg extension, musicality, and speed, among other qualities. The tension in the room was palpable as the hours ticked by. ACB’s fifth season premieres tonight and continues through the weekend with a program called “Shaping the Dancer.” Much of that “shaping” starts right after the audition phase, when company members develop and hone their technique during daily class—far from the bright lights of a stage. In this program (not featuring any of the new hires—it’s too early! ), Jones will provide a guided tour of a dancer’s training session and conclude with the opening pas de deux from George Balanchine’s La Source to illustrate how all of the elements come together. I spoke with Jones shortly after the auditions to learn more about a dancer’s experience offstage. Describe the audition process in a nutshell. We hold one audition in L.A. and one in New York each year, and we also make some private appointments for dancers to be seen in our company class. The latter case is for dancers who might not be able to make it to an open audition because of their professional schedule, but those appointments are limited, so they are prescreened through a submission including videos, photos, and a résumé. How many dancers were you looking for to fill positions, and when will they join the company? This year we’re looking for about three women and two men, but since much of the choreography we present is original, what I see at the auditions can alter that. If I see an exciting new dancer, I might create a role for him or her. Because of that, I don’t always have a rigid notion of what I need to find—I look to see what is there and can alter my plans a bit accordingly. We haven’t made our selections yet. What qualities were you looking for? When you made the cut to the final nine dancers during the L.A. audition, what made them stand out? I interview and retain the information of every dancer I think is a possible fit for the company, at every level from apprentice to principal. Even if we don’t bring them on this year, we might in the near future as we expand. There are certain requirements, such as height, that have to be considered so that we have a unified aesthetic. That said, some requirements can change a bit from year to year, depending on the makeup of the company and the position we’re looking to fill. The position for which we are considering the dancer also affects the qualities we look for. Our repertory requires that every dancer in the company dances a lot, so they all have to have a strong, well-rounded technique. They must also be musical and able to move quickly. A soloist’s technique should be a little stronger, and they should have some outstanding qualities that we can build on in their solo variations. They should also have some extra magnetism to their presence because they have to hold every eye in the room. Principals have to be the strongest; because they will dance the broadest range of difficult steps, their technique in all areas has to be excellent. They should also possess a highly refined musicality, which makes them entertaining to watch over longer periods. On the other end of the spectrum, the dancers we consider for apprenticeships need to demonstrate a lot of potential and eagerness to develop. And of course, dancers develop and evolve, so while you may consider someone for one position one year, you might consider them for a different position the next. How did the dancers’ talent compare if you look at L.A. versus New York? A good amount of the dancers we see at either location have flown there from another state where they are employed in a professional ballet company, so they can show up at either location based on where they live or which audition works better in their professional schedule. We have noticed a trend, though. We tend to see more dancers in New York overall, but fewer there make it to the interview phase. We interviewed nine in Los Angeles and only interviewed four in New York. But that said, the only dancer we hired from the open auditions last year was from the New York audition (Kelly Williams). During their interviews, some women emphasized their interest in doing “contemporary” dance. Does American Contemporary Ballet do “contemporary” dance? It’s a funny matter of terminology. Many people refer to what we do as contemporary, and some call it neoclassical. I refer to our work as “contemporary classical” because we make new ballets that strive for a classical aesthetic. I stay away from “neoclassical” because I think classicism reflects an ageless quality. It represents an ambition and a rigorous set of objectives rather than a period that can be done in a “new” way. We’re also called American Contemporary Ballet because we pursue the American tradition of ballet, produced by Balanchine in the 20th century. I want to build on that tradition, which I think is the most important legacy for the future of the art form. Balanchine was also the quintessential classicist. I assume most of the people who emphasize their interest in “contemporary” work in the interviews are referring to it that way since they are auditioning for us. Hopefully they’ve seen what we do and have an interest in it. Another dancer mentioned that she wanted to join ACB because dancers are involved in the choreographic process. Is that true? When dancers say they have an interest in being part of the choreographic process, (at least in most cases) they are referring to having a piece made on them versus learning roles that already exist. In our company they do influence the choreography in that the choreography is being created for their body, their particular set of abilities, and their dance personality; but it’s not a case of them making up their own choreographic phrases in tandem with the choreographer. Previous articleWho Knew David Arquette Was Such a Nice Guy?